Israel has set out a range of curbs on the jailed nuclear technician Mordechai Vanunu who will be freed on Wednesday. Vanunu has spent nearly 18 years in prison for revealing details of Israel's nuclear arms programme. Israel says he still poses a threat to national security and will not be allowed to leave the country or talk to foreigners without permission. Anti-nuclear campaigners have begun gathering outside Shikma prison in Ashkelon to welcome his release. Among the dozens of activists who have flown to Israel are British actress Susannah York and Irish Nobel Peace Prize laureate Mairaed Maguire. The government justified its decision to impose restrictions on Vanunu saying he "still possesses state secrets including some which he has not revealed". Israel's Prisons Authority has announced that Vanunu will be freed at 1100 (0800 GMT) on Wednesday. Israelis heard the 50-year-old's voice for the first time on Monday in a tape recording of a recent interrogation in which he defended his actions. The prisoner was combative and defiant, saying there was nothing more for him to add about Israel's nuclear secrets and querying the need for a Jewish state. 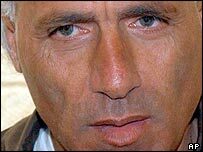 In a BBC interview, Vanunu's brother Meir called into question the veracity of the tape and said governments including the UK had a duty to ensure his protection amid a "very hostile" media campaign against him. The prisoner is widely despised as a traitor in Israel, though he has been embraced internationally as a hero by the anti-nuclear movement. Justin Moraham, an activist who travelled from Ireland for the occasion, criticised the imposition of sweeping restrictions after he served his sentence. "There has been a backlash which has drawn more attention to Israel's nuclear programme," he said. "I would hate to think they are acting out of vengeance but I can't find any other reason." Israel said it could have placed much tougher post-release restrictions on Vanunu - and the length of time the current regime will remain in force depends on his behaviour. The travel restrictions will be reviewed after one year, and the defence ministry says it has given him a map of Israel marking the areas off-limits to him. Israeli press reports also speak of some curbs in the Vanunu case being lifted - for example the ban on the media discussing his kidnapping in Rome by Israeli agents in 1986. A reported ban on his going near embassies in Tel Aviv has also been eased - but he cannot enter one. On the other hand he has been warned not to tell the media about his work at Dimona and to report to the police if anyone asks for an interview. He also may not reveal any classified information, even information that he had previously given to the Sunday Times and was published by the UK paper before his abduction 18 years ago. "They are continuing to portray him as a very dangerous man"